Take time to review weather forecasts and observe weather changes, fireline observations, and monitoring automated weather stations are helpful to supplement information from forecasts. Single Resource (crew, squad, and individual) are responsible for ensuring that they keep informed of fire weather conditions and forecasts so that they may base all actions on current and expected behavior of the fire. The procedures include obtaining and reviewing latest forecasts, taking observations to validate them through the assignment, reporting what is learned to those who need the information, and requesting forecast updates when appropriate. An early morning observation that represents time and conditions when the minimum temperature and maximum humidity occur. A late afternoon observation that represents the time and conditions when the maximum temperature and minimum humidity occur. When active fire behavior seems to increase and diminish during the burn period. Hourly throughout the afternoon or when changes occur, may be called for by fireline supervisors or dictated by changing conditions to ensure situational awareness. The weather observer should strive to pick observation sites that most accurately reflect environmental conditions around the fire’s location. Decide whether a ridge-top, mid-slope, or drainage bottom location is most representative. If on a slope, the aspect and slope steepness is an important consideration. Consider what is a representative fuelbed for the fire. Attempt to find a safe site upwind or on the flank of the fire. Generally, ventilated areas in the shade are desirable locations for the observation. Minimize the fire’s influence on your observation. Avoid taking observations in the black. Avoid observations affected by gusty indraft breezes and radiant heat from the fireline. Record whether the observations were made with an electronic weather sensor or traditional sling psychrometer. Electronic temperature and humidity sensors should be calibrated regularly against weather instruments of reliable accuracy. Check the batteries. Accurate weather observation is of little use unless it is properly communicated in a timely fashion to those who need it. Make sure that current observations are reported verbally over the radio to ensure situational awareness. Follow instructions for periodic radio reports to fireline supervisors and/or incident communications unit. Report measurements with trends, i.e., Temperature: 75°, up 5º degrees from last hour. Provide written documentation of weather observations to the fireline supervisor, situation unit, incident meteorologist, or the local weather forecast office. Retain a copy for your records. Don’t assume that weather observations are automatically being received by the proper users. The weather observer may need to take the initiative to verify that the information is being passed up the line. Forms are available. Wind speed and direction is the most variable weather factor over the duration of an assignment, the observer will be concerned with adjusting and validating forecasted winds as much as measuring current wind Speed. 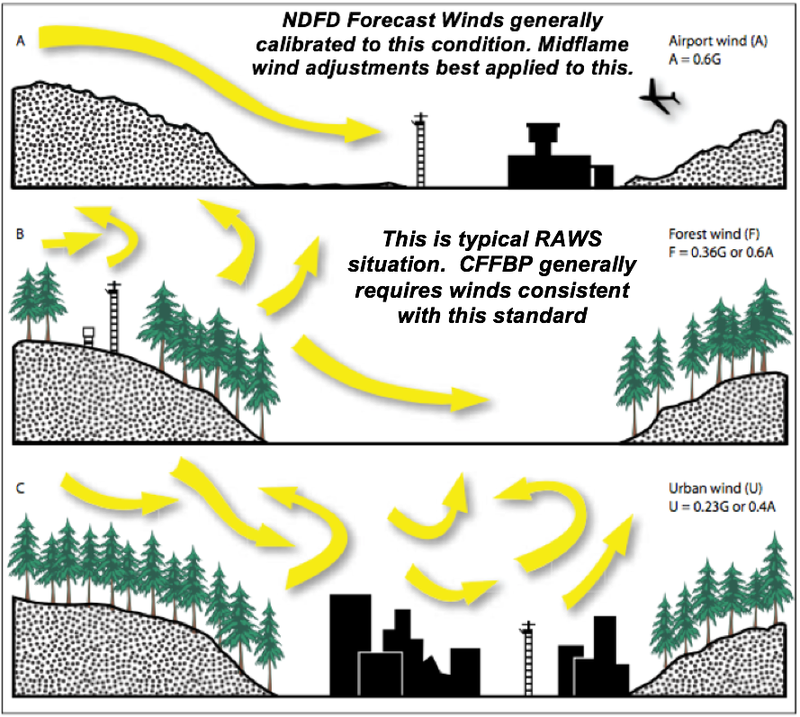 It is difficult for a meteorologist to produce localized wind forecasts, especially if the wind is influenced by terrain features. Forecasted winds will frequently need adjustment because they are representing a wind other than mid-flame, such as ridgetop or surface winds. Consider wind categories and definitions. It will be important to communicate with the meteorologist the factors that influence the wind measurements that are provided. Report observation by type and/or height. Identify sheltering and aspect/slope position for the wind observation and note whether local winds are influencing the observation. If the weather forecast product provides wind speed as free air or ridgetop, or if winds in the fire area are influenced by local winds, it may be necessary to use the worksheet for estimating 20 feet surface winds. Identify speed and direction of any forecast critical wind. Determine speed and direction of any local winds. Determine speed and direction of general winds and whether they will influence the 20 feet wind. Combine factors above into an estimate of local surface (20 feet) wind speed. 0 Less than 1mph Calm Calm, smoke rises vertically. 1 1 to 3mph Very Light Breeze Leaves of quaking aspen in constant motion, small branches sway, tall grasses and weeds sway and bend with wind, wind vane barely moves. 2 4 to 7mph Light Breeze Trees of pole size in the open sway gently, wind felt distinctly on face, leaves rustle, loose scraps of paper move, wind flutters small flag. 3 8 to 12mph Gentle Breeze Leaves, small twigs in constant motion, tops of trees in dense stands sway, light flags extended. 4 13 to 18mph Moderate Breeze Trees of pole size in the open sway violently, whole trees in dense stands sway noticeably, dust is raised in the road. 5 19 to 24mph Fresh Breeze Branchlets are broken from trees, inconvenience is felt in walking against wind. 6 25 to 31mph Strong Breeze Tree damage increases with occasional breaking of exposed tops and branches, progress impeded when walking against wind. 7 32 to 38mph Moderate Gale Severe damage to tree tops, very difficult to walk into wind, significant structural damage occurs. 8 39 to 46mph Fresh Gale Surfaced strong Santa Ana, intense stress on all exposed objects, vegetation, buildings, canopy offers virtually no protection. 9 47 to 54mph Strong Gale Slight structural damage occurs, slate blown from roofs. 10 55 to 63mph Whole Gale Seldom experienced on land, trees broken, structural damage occurs. 11 64 to 72mph Storm Very rarely experienced on land, usually with widespread damage. 12 73mph or more Hurricane Force Violence and destruction. Eye-level wind speed is usually assumed to be the same as mid-flame wind speed. However, as suggested in the Fireline Assessment Method (FLAME) reference, it may be too low for flames in shrub fuels and too high for flames in forest litter. In any case, it may be necessary to adjust forecasted 20 feet winds or observed mid-flame wind speed to make comparisons and validate forecasts. The observer should face directly into the wind and closely observe the wind speed indicator fluctuations. Exposure to sunlight is not a concern during the wind observation. An eye-level wind speed measurement requires at least one full minute of sampling and preferably more. Note time and rapidity of transitions in diurnal winds. When using a Dwyer tube, mentally average the wind speed and note the peak gust during the sampling period. Electronic sensors make wind averaging and gust measurement easy. They are more accurate and are preferred for eye level wind speed observations. Remember - the wind direction is defined as the direction the wind is coming from. The influence of slope on fire spread is applied as a slope-equivalent wind speed. Where slope is significant (generally 20% or more), all the fire behavior assessment tools in the Surface Fire Section, Surface Fire Behavior Worksheet, (FLAME, Lookup Tables, Nomograms & Nomographs, and BehavePlus) provide means for estimating effective wind speed. Adjusted slope wind speed should be used in place of mid-flame wind speed estimate in fire behavior predictions. Estimating temperature, relative humidity, and dew point can provide insight to critical fire behavior thresholds for ignition and crown fire potential. The following are instructions for determining wet and dry bulb temperatures using the sling psychrometer. These instructions are based on those from page 259 of the S-290 Instructors Manual. Additional comments have been added. If your sling has been in your pack, you may need to hang it in a tree, in the shade, to let it adjust to the outside air temperature. This may be a good time to take the wind observation. Stand in a shaded, open area away from objects that might be struck during whirling. If in open country, use your body shade to shade the psychrometer. If possible, take weather observations over a fuelbed that is representative of the fuel that the fire is burning in. Stay away from heat sinks. Face the wind to avoid influence of body heat on the thermometers. Saturate the wick of the wet bulb with clean, mineral free water (distilled, if available) at air temperature. Ventilate thermometers by whirling at full arm’s length. Your arm should be parallel to the ground. Whirl for one minute. Note the wet bulb temperature. Whirl for another 40 or 50 times and read again. If the wet bulb is lower than the first reading, continue to whirl and read until it will go no lower. Read and record the lowest point. If the wet bulb is not read at the lowest point, the calculated relative RH will be too high. Calculate dew point each time. If it is changing significantly it may suggest a bad observation. Read the dry bulb immediately after the lowest wet bulb reading is obtained. Determine the RH from the tables. Changing psychrometers from one observation to the next, try to use the same throughout. Not ventilating the psychrometer long enough to reach equilibrium. Not getting the wick wet enough, or letting it dry out. Holding it too close to the body or taking too long to read the thermometers. Touching the bulb ends with the hands while reading. Not facing into the breeze. Psychometric tables are included in the belt weather kit and provided on this site. The tables allow you to estimate RH and dew point from dry bulb and wet bulb temperatures. Find the correct table based on elevation at your observing location. Use your DB Temp and WB Temp to find the intersecting cell on the page. Read the resulting RH (below) and dew point (above) in that cell. 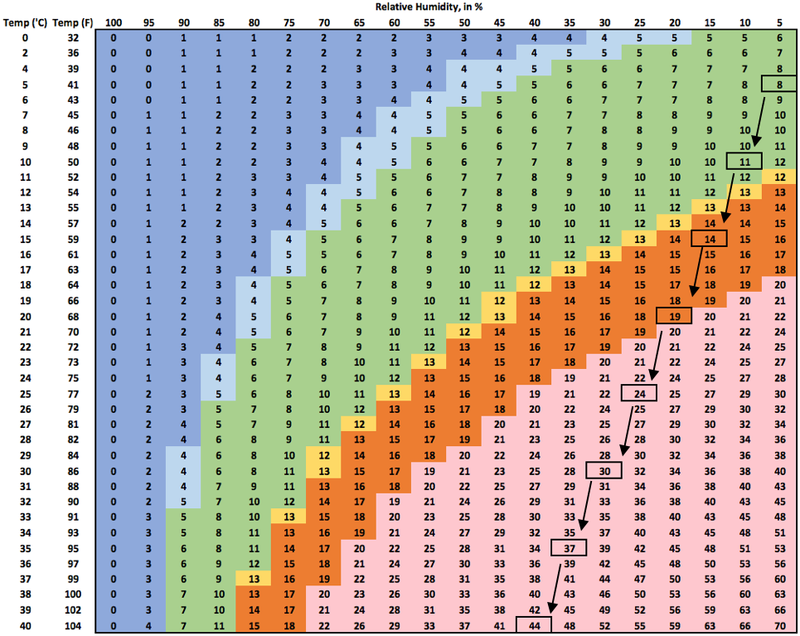 Each Table is labeled with an Elevation Range, including an adjustment for Alaska. 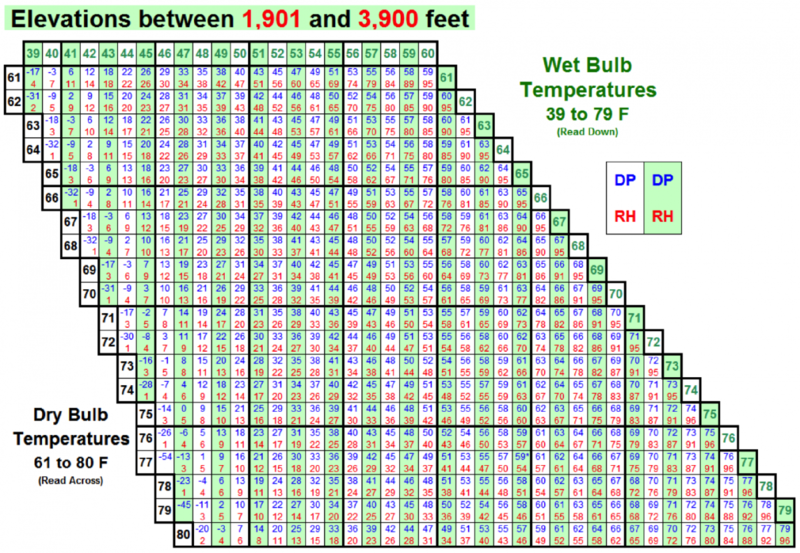 Dry bulb Temperature is located on the left axis and the wet bulb temp is located at the top of each column. Cell at their intersection includes the resulting RH and dew point. Case 1: Estimate RH for an elevation above or below the observation - assuming an average lapse rate of approximately 4° F, increase the temperature by 4° F for each 1000 feet drop in elevation or decrease it by 4° F for each 1000 feet increase in elevation. Using the new temperature and the estimated dew point, look up the new RH in the appropriate psychometric table. Case 2: Validate a forecasted RH - using the estimated dew point and the forecasted temperature, look up the new RH in the appropriate psychometric table. While RH refers to the amount of water vapor in the air as a percentage of saturation levels, Vapor Pressure Deficit represents an absolute measure of the difference between the moisture in the air and the amount it could hold when saturated. VPD rises as the moisture deficit increases and may seem counter-intuitive for users comfortable using RH. It follows a seasonal trend of low levels in the winter and higher levels during the warm summer months, controlled by variation in temperature and atmospheric humidity. VPD can provide important insight about the role of ambient temperature as well as atmospheric humidity. For example, at low temperatures a low RH will not be accompanied by significantly high VPD levels. But that same low RH under high temperatures will produce elevated VPD. The table below here provides an example interpretation. Long used in greenhouse and agricultural applications, it is a good indicator of the moisture stress experienced by green vegetation. The new Growing Season Index (GSI) uses it as a key criterion to green-up and curing phenology. GSI considers VPD of 9 mb optimum growing conditions. The Crossover Concept (Alberta Forest Service 1985) refers to rising temperature (in °C) and falling RH reaching the point where they are equal (highlighted boxes in the table). Interpretations suggest the potential for extreme fire behavior. Synoptic (Large-Scale) forecasts and representations of current conditions include reference to the relative stability of the atmosphere in the area. There are numerous indicators that can be reviewed and interpreted, several are referenced on the stability page. A stable atmosphere generally tends to limit violent vertical motion. As a result, cloud build-ups during stable conditions tend to be wider and flatter, sometimes covering much of the sky. Note: strong general winds are possible during stable conditions depending upon the weather pattern. Unstable conditions tend to enhance vertical motion and increase ventilation of active fires. General atmospheric conditions can be influenced by the terrain and other local factors to produce more localized effects. The weather observer can provide important information to meteorologists by reporting the visual cues and the timing of changes throughout the day. Visual cues are associated with a weather observation by recording them in the remarks column so that they get a time stamp. The firefighter should pay attention to the fire weather forecast and keep an eye on the sky for indicators of severe conditions that can influence the fire environment. Usually, if a visual cue is worth noting with the weather observation, photography can be very valuable supporting documentation. If a photo is taken, use a photo log or reference the photo number with the location date, time and other identifying comments. Lightning should be reported immediately to alert fireline supervisors to take appropriate precautions and to cue meteorologists to review their lightning detection tools. Sudden wind shifts may be important indicators of breaking inversions or frontal passage. Rising smoke column indicates neutral or instable conditions. Flattening column indicates inversion at that point. Smoke column change direction as it rises indicates wind shear or local wind influence. Smoke column developing a pyrocumulus cap cloud indicates strong instability and impending down drafts. Haze and poor visibility are indicators of inversions. Is this localized (night-time inversion) or more general and persisting throughout the day? Note: if haze or poor visibility abates during the burn period, this is an indicator of increase in fire behavior. Dust clouds radiating away from thunderstorms indicate potentially dangerous downdrafts. Dust devils are important indicators of surface instability. Firewhirls occur when convection from the fire combines with winds influencing the fire, adjacent terrain features that create eddies, instability from cold fronts, and/or multiple interacting fire plumes. Firewhirls are difficult to predict. Note: Be aware of the potential for gusty erratic winds and firebrand transport when dust devils and firewhirls are observed. Clouds occur when moisture in the atmosphere condenses into visible droplets or ice crystals. This usually occurs when moist air becomes cooled by lifting. The shape and texture of clouds reveals much about whether the lifting process has been gradual and gentle or rapid and potentially violent. Paying attention to the sky can help the firefighter stay aware of the current fire environment as well as anticipation of potential changes. Cloud cover, in percent, is an important input for fuel moisture shading. Building cumulus, towering cumulus, or thunderstorms are all indicators of significant instability that is probably already influencing surface winds. Showers or virga may be indicators of instability. The NWCG Fire Weather Cloud Chart, PMS 438, depicts sky signs of interest for wildland firefighters that are valuable tools in revealing the atmosphere’s current state as well as foretelling potential changes. Clouds are an important indicator of stability. Cumulus (several varieties) - Weak instability. Normally not a concern for firefighters. However, when cumulus continues growing, firefighters are advised to keep an eye on the buildups due to the potential for sudden downdrafts and gusty winds. Alto Cumulus (several varieties, e.g. castellanus) - Upper atmosphere instability and possible weather change. These indicate increasing moisture and instability with the potential for thunderstorms. Cumulonimbus - Very unstable. Fully developed mature thunderstorms contain extreme vertical motion and the strong likelihood of gusty, erratic winds that can arise suddenly miles away from the cloud buildup. Localized wind gusts over 100 mph are possible with very strong thunderstorms along with lightning, virga, and hail. Very strong thunderstorms may also be accompanied by shelf clouds or tornados. Clearly, cumulonimbus clouds portend many hazards to the firefighter exposed on the fireline. Pyrocumulus - Very unstable. Pyrocumulus clouds grow above ongoing wildfires drawing energy from the heat of combustion and condensation of moisture in the fire’s convection column. A white-capped pyrocumulus cloud is a concern for firefighters for the same reason as a thunderstorm - strong, gusty erratic winds can arise suddenly near a pyrocumulus. Virga, light raindrops, and even some lightning is possible with well-developed pyrocumulus clouds. 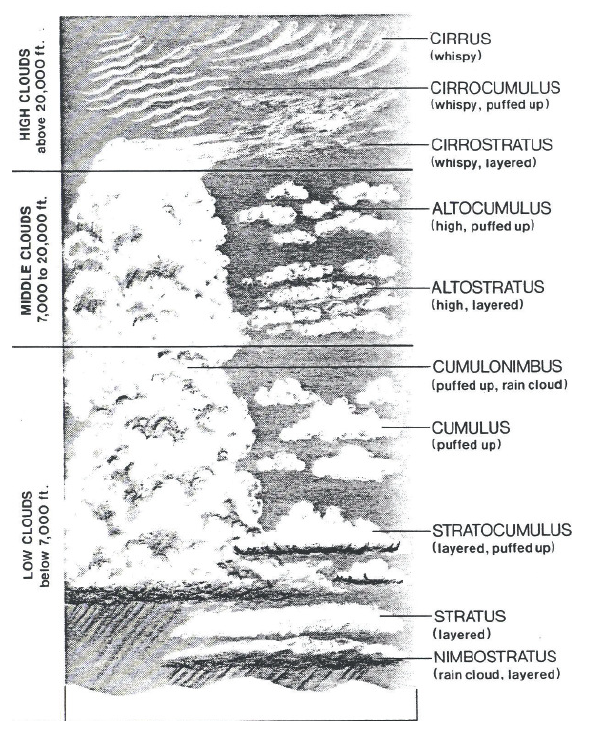 Stratus (several varieties) - Stable and moist. Stratus clouds can cover much of the sky and blot out sunlight or even bring rain. Stratus clouds tend to mean higher humidity and decreased fire behavior. Normally not a concern for firefighters. Cirrostratus (several varieties) - High level stratus clouds formed of ice crystals. Cirrostratus clouds are normally not a concern for firefighters. However, if these clouds increase from the west or northwest, a front may soon be approaching with strengthening general winds. Check the fire weather forecast. Altostratus (several varieties) - Mid- to high-level stratus clouds that are a good indicator of an approaching front with strengthening general winds. Check the fire weather forecast. Wave cloud or Lenticular cloud - Smooth, almond-shaped clouds that sometimes form over mountainous terrain in patterns similar to stacked dishes. These clouds tend to remain fixed over one peak and are a good indicator of strong general winds in the upper atmosphere that may descend to the surface. 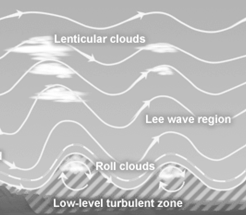 Wave clouds are sometimes seen during foehn wind events. Check the fire weather forecast. Mesowest at the University of Utah provides information and tools formerly available via ROMAN. National Weather Service Weather and Hazards provides weather observations in context with radar, forecasts, and wildfire information. Weather Underground provides observations from websites and web apps. Iowa Environmental Mesonet provides access to current and historic data. Remote Automated Weather System (RAWS) are sited to assist land management agencies with monitoring air quality, fire weather, and support of research applications. There are a variety of standards, though the fire weather stations adhere to a different standard called for by the National Fire Danger Rating System (NFDRS). Incident Remote Automatic Weather Stations (IRAWS) are intended for use on or near the fireline and can be rapidly relocated as desired by Fire Behavior Analysts (FBAs) or Incident Meteorologists (IMETs) to provide timely weather data. Fire Managers, FBAs and IMETs use IRAWS data to predict fire behavior, prescription burning times, fire weather forecasting, and canyon and ridge top winds. Generally, like RAWS equipment, mast heights may vary. Automated Surface Observing System (ASOS) and Automated Weather Observing System (AWOS) stations located generally near airports to serve aviation needs. ASOS stations also serve as a primary climatological observing network. They adhere to international standards for weather observations. A wide variety of other station networks are available and may be appropriate for local and ad hoc uses. Generally, four factors govern the surface wind estimate produced by automated weather observing sensors. Local terrain influences on the general winds at any location due to exposure and differential surface heating related to slope, water and ice factors and channeling of general winds or air flow. Teh image below demonstrates the effect of terrain on wind measurements in different locations (Bishop, 2010). Sensor standards for timing and duration of observation - fire weather standard averages wind speed over 10 minutes while International standard averages wind speed over two minutes. Surface characteristics that produce differing friction factors - trees and buildings vs airports and agricultural regions. See figure.